Most of the work that we carried out at UCL in evaluating the quality of OpenStreetMap is focused on England, and particularly on London. This is mainly due to the accessibility of comparative datasets. The reason for this was the availability of data, as the Ordnance Survey research unit kindly provided me with the full Meridian 2 dataset for comparison. More detailed comparison, for which we used MasterMap, came from the wonderful Digimap service, though because of the time that it takes to process it we were limited in the size of the area that was used for comparison. One of the open questions that remained was the accuracy of data collection in other parts of the world. Luckily, Ourania (Rania) Kounadi, who studied our MSc in GIS at UCL, had access to detailed maps of Athens. She used a 1:10,000 map from the Hellenic Military Geographic Service (HGMS) and focused on an area of 25 square kilometres at the centre of the city. The roads were digitised from the HGMS map, and then the Goodchild-Hunter procedure was used to evaluate the positional accuracy. 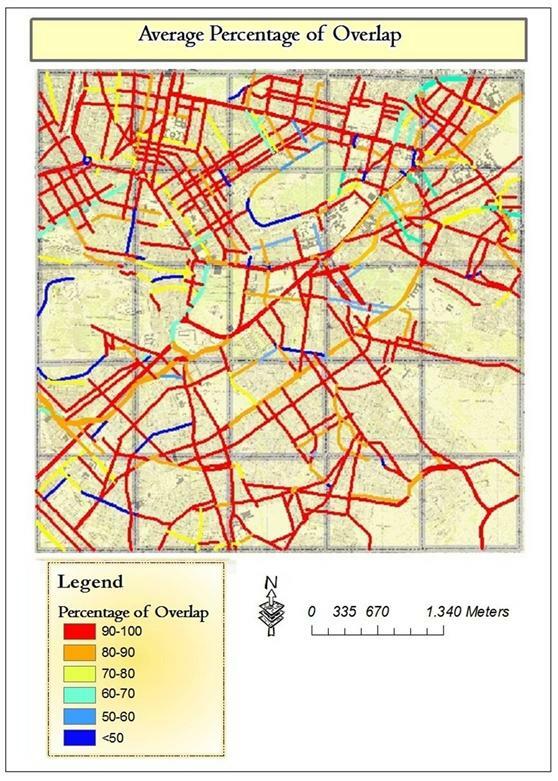 The results show that for most of the roads in the evaluation area there was an overlap of 69% to 100% between OSM and HGMS datasets. The average overlap was very close to 90%. Her analysis also included attribute and completeness evaluation, showing that the quality is high on these aspects too. So a pattern is starting to emerge showing that the quality of OSM data is indeed good in terms of positional accuracy. This is surprising at first glance – how come people who are not necessarily trained in geographical data collection and do not use rigorous quality assurance processes produce data that is as good as the authoritative data? Rania’s dissertation is available to download from here.